"Swedish functionality with French style"
Ron Dorff was looking for a solution to translate its e-commerce website that was easy to implement and that would allow them not to forget any translation. A multilingual website with 150 translated products ready in a few days without technical intervention. A robust solution that supports a 400% growth in traffic to Ron Dorff’s e-commerce website over 2018. Ron Dorff leverages Weglot to translate their Shopify store in multiple languages. “Swedish functionality with French style”. This is the slogan of Ron Dorff, the young French-Swedish sportswear brand founded in 2011. Its origins have given the brand an international dimension since its inception and it is only natural that Ron Dorff’s team wanted to offer an e-commerce website in multiple languages to its customers. Ron Dorff very quickly met a great success in France but international has always been a priority. With more than 70% of international sales this year, this commitment has paid off for Ron Dorff. We generate more than 70% of our sales from exports, particularly to the United Kingdom, the United States and Germany. Once the decision was made to include Weglot in the Ron Dorff website, the integration was very simple. With one person in charge of content, Ron Dorff’s team didn’t want to have to spend several months developing a new website to fully integrate the international dimension. Having already a Shopify website, it only took downloading the Weglot Translate app which is available on the Shopify App Store. In a few minutes, all the content of the website is detected and all that remains is to check or edit the proposed translations. Everything was ready in less than fifteen days and, with no need to call in a developer to update the e-commerce website. With more than 150 referenced products and a constantly evolving catalog, it can quickly be a real challenge to offer quality content in multiple languages. Before discovering Weglot, Ron Dorff’s team was wasting a ton time finding all the content that needed to be translated and checking the quality of the translations. After testing several solutions, Ron Dorff’s team simplified its translation process with Weglot. Now, all translations of the Ron Dorff e-commerce website are easily retrieved and editable from Weglot’s unique interface. “Weglot interface is really friendly and easy to use. You can find all your content in a few clicks and then translate it quickly and efficiently.” explains Jamila Halloum, Digital Marketing Director at Ron Dorff. Now, Ron Dorff’s editorial team just need to focus on writing and translating the content properly. Well referenced products on Google, in all languages. Google SEO is obviously essential for an e-commerce website like Ron Dorff. 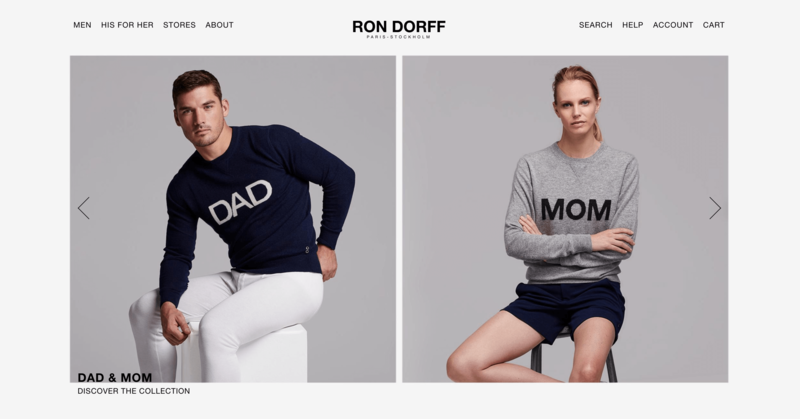 Thanks to Shopify, Ron Dorff’s e-commerce website benefits from good search engine optimization, but SEO questions arise when translating a website: How to be well indexed on Google in all the languages? Will translating my site damage my SEO? Weglot answers all of these questions and follows Google’s guidelines in terms of “multilingual SEO”. 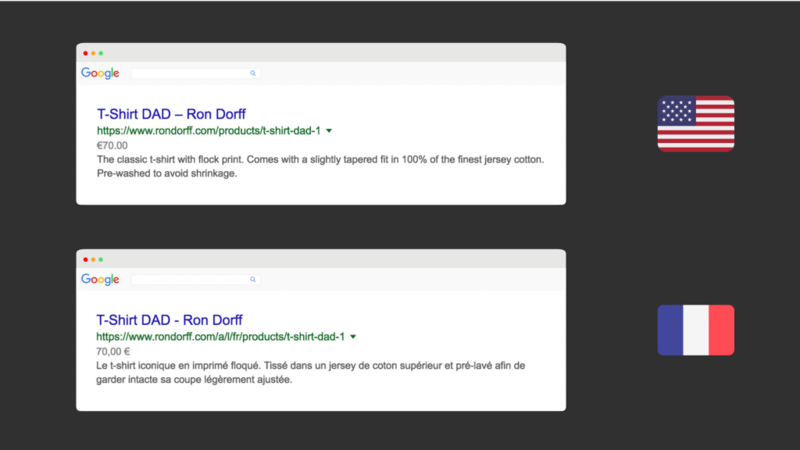 A French-speaking visitor looking for “Ron Dorff Dad t-shirt” on Google, can therefore directly see the French page of the requested product while an English-speaking visitor will continue to see the page in English. Weglot has assisted Ron Dorff in its growth in France and abroad with an increase of more than 400% in the number of visits to its e-commerce site in 2018.